My son LOVES cats. He loves dogs too but he has a real one he can pet and hug. As far as cats go I am allergic to them so he does not get to have one. He has movies of cats (Kitten Party) toy cats (fur real ones) and cat books. He tells me all the time cats say meow! We were at the mall last month and saw the super cool Cat balloon at a booth near the kids play area. Of course he yelled Kitty Cat!! They were a cool new novelty balloon called My Own Pet Balloon. They are really sweet balloons for kids to have. My son got his Kitty Cat Balloon on his birthday at his party. He gave it a huge hug as soon as I handed it to him. He was so happy. He pulled it around by the leash that comes with the balloon. He also jumped on it, petted it, kissed it and at one point grabbed it by the tail and pulled off one of its legs. Another reason we cant get a real cat lol! The leg has sticky on the part that attaches it to the cat and it went right back on good as new. The cat does need to be blown up by helium to work but you can take it to your local grocery store, party store or florist who can fill it up for a couple bucks. Or you can do what we did and get a helium balloon kit and use the air that comes with it. 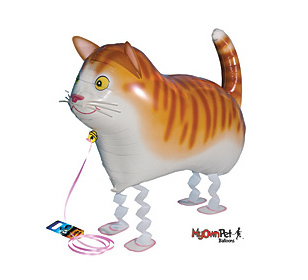 Its a great addition to a party for your kid to have their very Own Pet Balloon. I want to get my son few of the dog ones or the pony since he will be getting cowboy boots soon. Win your very own Pet Balloon. Winners Choice on animal you want. Which My Own Pet Balloon will you pick if you win? *Limited to US residents; 18 years old and above. Giveaway starts November 23, 2011 and ends on December 3 , 2011 at midnight PST. Winner will be emailed and has 48 hours to respond before another winner is selected. I was not paid for this giveaway or post. The opinions on this item are 100% mine and may vary from others. The sponsor is responsible for providing the prize. I would definitely choose the Ladybug! I'm pretty sure my daughter would go crazy over that! I like My Own Pet Balloons on Facebook! I follow My Own Pet Balloons on Twitter! I would pick the ladybug. I follow my own pet balloon on twitter as kmayans. My son would love the panda.Thanks! I like my own pet balloon on FB as Leslie Luke Stanziani.Thanks! I follow my own pet balloon on twitter as lstanziani.Thanks! LOVE the Horse, but they're all so cute!!! ((1955nursehjc4me(at)myway(dot)com)) TY! I would choose the Shetland Pony balloon. I follow My Own Pet Balloons on Facebook under the username likwan. I follow My Own Pet Balloons on Twitter under the username likwan. I shared this giveaway on Facebook at http://www.facebook.com/likwan/posts/298605250173323. I tweeted about this giveaway on Twitter at https://twitter.com/#!/likwan/status/143241767494488064.